To Cite: Arash V, Sobouti F, Haghanifar S, Dabbaghian I, Bijani A, et al. Dentoskeletal Effect Induced by Hyrax Screw Used in Maxillary Molar Distalization: Before–After Study in Class II Patients, Iran J Ortho. 2014 ; 9(3):e4852. doi: 10.17795/ijo-3746. Background: Maxillary molar distalization with intraoral or extraoral appliances is a common treatment modality in non-extraction treatment plan. Objectives: In this study, an appliance with hyrax screw was used for maxillary molar distalization. Our purpose was to evaluate the amount of molar distalization, type of molar movement, effects on anterior teeth, and amount of changes in lower anterior facial height. Patients and Methods: 24 class II patients (13 females, 11 males) with bilateral half cusp class II molar relationship were participated. The appliance was made by hyrax screw for producing distalization force. Pre and post distalization lateral cephalometric radiographs and dental casts were evaluated. Lateral cephalograms and study models were obtained before treatment and after 12 weeks activation of the appliance (one turn per week). Results: Cephalometric measurement demonstrated that, first molars tipped 2.9 degrees and displaced 1.76 mm. First premolar and upper incisor tipped 3.4 and 4.2 degrees, displaced 2.9 and 2.4 mm respectively. All of these results were statistically significant. The mean of maxillary first molars distaliztion was 2.6 mm per side in approximately four month. The mean of first maxillary molars tip was 3.93˚ and the mean of anchorage loss at the first premolars was 1.95 mm, but the crowns tipped 3.45˚ mesially. Lower anterior facial height (ANS-GN) and mandibular plan angle (GO-GN) increased, 0.7 ± 0.21 mm and 0.76 ± 0.32 degree, respectively, but were statistically insignificant. Conclusions: It can be concluded that proposed appliance can correct class II molar relationship. Molars displaced distally by bodily movement and tipping. Non-extraction treatment of class II malocclusion needs distalization of the upper molars to correct molar relationship and create enough space to resolve increased overjet and dental crowding. Compliance-dependent appliances such as headgear and removable appliance were traditionally used for upper molar distalization (1-3). The need for patient compliance in achieving Class II correction is often the most limiting factor in determining the duration and the success of these treatments. Several intraoral distalizing appliances have been described in last years to make treatment success independent of patient compliance (4, 5). Numerous fixed intraoral appliances such as pendulum appliance, jones jig, magnets, coils, distal jet, first class appliance, and mini implants have been developed to overcome the limitations of headgear and decrease dependence on the patient’s compliance (6-14). Also, in recent years skeletal anchorages, such as miniscrews were very popular for molar distalization in non-growing patients (15, 16). Hyrax screw is usually used for rapid palatal expansion. In this study an intraoral fixed appliance for molar distalization was introduced. This appliance was bonded to the first molar and second premolar and contained an ordinary hyrax screw to produce the distalizing force. The purpose of this study was to investigate the dentoalveolar and skeletal effects during distalization by this type of appliance. 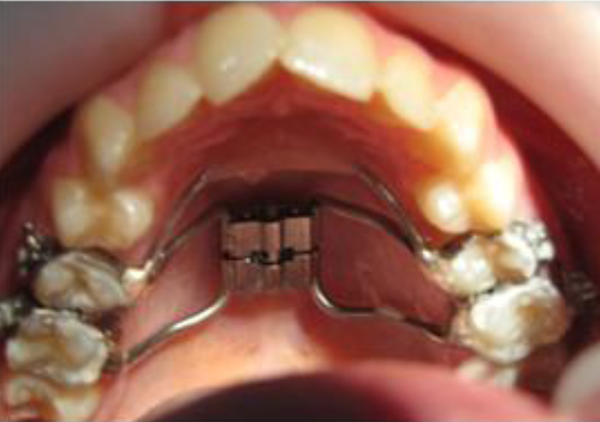 In this clinical before - after study, the sample consisted of 24 consecutively class II orthodontic patients (13 females and 11 males) treated with proposed distalization appliance. All patients were treated by the same orthodontist. The mean age of the samples at the time of the initial records was 14.4 ± 2.4 (range: 12 - 16 years). F. Diagnostic cephalometric radiographs with high quality and corresponding good visualization of landmarks taken at the beginning of treatment and immediately after completion of distalization. After giving expected advantages and disadvantages of appliance, informed consent was signed by parents before starting the treatment. Patients received proposed appliance with hyrax screw for maxillary molar distalization. 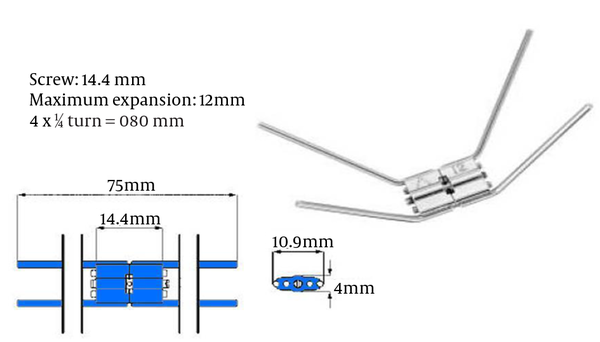 Proposed appliance consisted of 4 bands (GAC, Densply, USA) 4 arms and the body of screw (14/12, Dentaraum, Mini expander screw, Germany) (Figure 1). Two bands were placed on the maxillary first molars as distalization unit and two bands were placed on the maxillary second premolars as anchorage unit. 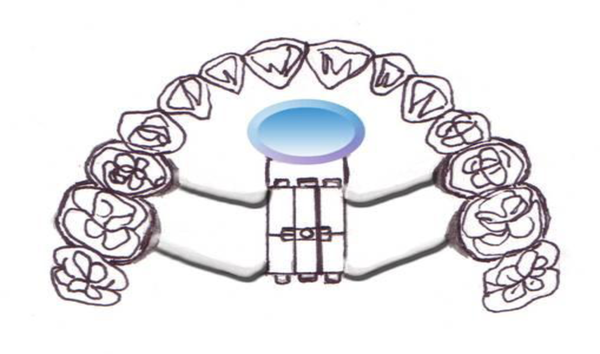 The palatal acrylic button (Acropars, Iran) that supported appliance was anchored anterior to hyrax with 0.9 stainless steel wire (Dentaraum, Germany) for reducing anchorage loss (Figures 2 and 3). Before pretreatment cementation of appliance, lateral cephalometric radiograph (T1) was taken. Then appliance was seated and luted with self-cured glass ionomer luting cement (Fuji II Lc; GC co, Japan). The study was approved by the ethical committee of Babol university of medical sciences and was done under its observation. Screw was activated by means of a key at the rate of one quarter of a turn in three days every week. 360˚ opening of this screw produced 0.8 mm distance. Therefore, one turn opening led to 0.2 mm movement. The first stage in manufacturing the appliance was to determine the location of screws which was placed parallel to the occlusal plane, between the first molar and second premolar. Whereas, the line of action of the force passes through molar’s center of resistance, less tipping was expected in these teeth. Parents were instructed to open the screw in the beginning of the night. The first patient visit after appliance insertion was one week after bonding. Patients were visited every two weeks until the end of treatment. After 12 weeks, the force exertion was discontinued and post distalization lateral cephalometric radiograph (T2) was taken. The pre and post distalization lateral cephalometric radiographs were taken in natural head position and same magnification with Planmeca 2002 EC praline (Helsinki, Finland). All radiographs traced by one orthodontist. Amount of opening space has been assessed by measuring the distance between mesial surface of first molar and distal surface of second premolar in height of contour on pretreatment and post treatment dental casts. We used digital caliper with 0.01 mm accuracy for linear measurements and protractor with 0.5˚ accuracy for angular measurements. All radiographs were taken in an identical center with an identical radiographic set. They were traced manually using a 0.5 mm pencil. All radiographs were traced twice and the mean value was reported as the final measurement. Tracing was done by one orthodontist with intra operator reliability of 0.9. Positional changes of the central incisor were measured based on alterations in the position of the incisal edge. In order to investigate the position of the molars and premolars, the centroid point of their crowns which was the midpoint of the line connecting the mesial height of the contour to the distal height of the contour was selected. The perpendicular bisector of this line was considered as the teeth’s long axis. The line connecting the apex to the incisal edge was considered as the long axis of the central incisor. The palatal plane was used as the horizontal reference line to determine the vertical positional changes of the teeth. According to perpendicular line from mesiobuccal cusp tip of molars, buccal cusp tip of premolar and incisal edge to palatal plane dental extrusion was measured. Petrygoid vertical line (PTV) was used to investigate the anteroposterior changes. The angles formed between long axes of the teeth with SN were used to determine the amount of their tipping. Lower anterior facial height (ANS-GN) and mandibular plane angle (GO-GN) were also measured for each patient to investigate possible skeletal changes. For measuring dental extrusion, we use distance between mesiobuccal cusp tip of molars, buccal cusp tip of premolar and incisal edge to palatal plane with perpendicular line. Statistical analyses used for this study were t-paired test and Wilcoxon test. Pretreatment and posttreatment cephalometric measurements are listed in Table 1. In this study, maxillary first molars tipped distally 2.95 ± 2.98 degrees on the average that was statistically significant (P < 0.01). Mesial tipping of the first premolar and upper incisor were 3.45 ± 2.56 (P < 0.01) and 4.2 ± 1.5 (P < 0.001) degrees, respectively, which were statistically significant. The mean amount of distal displacement of maxillary first molars and second molars was 1.76 ± 0.7 mm (P < 0.01) and 1.55 ± 0.87 mm (P < 0.001), respectively, which were statistically significant. First premolars and upper incisor displaced mesially 2.45 ± 1.09 mm and 2.98 ± 1.25 mm which were also statistically significant. In dental casts analysis the mean amount of space opening between second premolar and first molar from was 3.45 ± 1.09 mm which was also significant (P < 0.001). The first molars and second molars extruded 0.088 ± 0.06 mm and 0.95 mm, respectively, which were statistically insignificant (P = 0.042). The changes were minimal in anteroposterior dimension and there was no significant change after distalization. In vertical dimension, lower anterior facial height (ANS-GN) and mandibular plan angle (GO-GN) increased, 0.7 ± 0.21 mm and 0.76 ± 0.32 degree, respectively, but were statistically insignificant. In dental casts analysis, the overbite was decreased on average of 0.23 ± 0.15 mm (P = 0.06) (Table 1). In recent years, various intraoral appliances have been presented for correction of class II malocclusion without extraction. The present study investigated skeletal and dental effect induced by proposed banded appliance with screw on 24 patients. The first molars and second molars moved distally 1.76 ± 0.7 mm and 1.55 ± 0.87 mm, respectively in about 12 weeks. Table 2 compares these results with some other studies using intraoral distalizing appliances (17-33). In first view, it seems that the amount of distal molar movement via proposed appliance is less than other methods. It is logical to compare distal molar movements per month (rate of distalization) instead of comparing pure molar movements (Table 2). Referring this table, rate of distalization for proposed appliance (Banded hyrax screw) is 0.69 and more than distal jet (23), pendulum in some studies (26, 28, 31), jones jigs in most of studies and magnets (6-8, 17). Rate of molar distalization is equal with coils and jigs (20, 21). Although the amount of distal molar movement via banded hyrax screw in current study was less than other appliances, the mean of molar tipping was less instead (18, 26, 27, 33) (Table 2). Because of less molar tipping in comparison to other studies, proposed appliance may be moved molars distally more bodily (Table 2). It should be pointed out that in this study second molars in all patients had erupted. Less tipping may also be the result of less distal movement and less duration of treatment, and if molars were distalized as much as other studies, they might have tipped more. Existence of the second molars may be another possible reason for less distal movement. a Abbreviation: N.A, non assessed. Anchorage unit for molars distalization was provided by nance button, second premolars and maxillary supporting bone. Mesial displacement of anchoarage unit assumed as anchorage loss. First premolars and upper incisor displaced mesially 2.45 ± 1.09 mm and 2.98 ± 1.25 mm and mesial tipping of the first premolar and upper incisor were 3.45 ± 2.56 (P < 0.01) and 4.2 ± 1.5 (P < 0.001) degrees, respectively. Comparing these amounts by other studies (Table 2) show that anchorage loss by premolar mesial movement was less than the reports of Ghosh and Nanda (31) (pendulum), Keles et al. (25) (IBMD) and Patel (32) (Distal jet), Haydar and Uner (20) (jones jig), Ngantung et al. (24) (distal jet), Chiu et al. (distal jet), Papadopoulos et al. (18) (modified jig) while it was more than the other reports (magnet, supercoil, Jones jig in some studies) (Table 2). Incisor flaring was more than the majority of past records a reason for anchorage loss in this research may be the existence of second molars (19, 20, 28, 30, 33). In this study, all the second molars had erupted and were moved with the first molar which may produce more mesial movement in anchorage unit that results anchorage loss. To solve this problem, Gianelly suggests distalizing the first molar before eruption of the second molar. He also suggests that for cases in which second molars have been erupted, at first attain distalizing second molars and after stabilization of their position, start distalization of first molars. This method has been suggested to result in less anchorage loss; however, it increases the duration of treatment up to at least 6 mounts (10, 12). Another factor that may have an effect on the anchorage loss is the force magnitude generated in different appliance. Generally, movement of one molar requires 80 - 100 g force and simultaneous movement of two molars in each sides need 160 - 200 g force (35). In this study the molars and premolars were extruded but vertical dental changes were not statistically significant. In other way, the amount of vertical changes was not remarkable in comparison with distal movement of molars. In Toroglu et al. (27) study (pendulum), Chaques Ascnsi) and Kalna (29) (pendulum) and Bondemark et al. (8) (magnet), incisor bite opening was greater than the present study (34, 36, 37). Because of minimal extrusive movement during distalization, and minimal flaring of incisors, anterior bite opening was not statistically significant. Regarding the results of this study, anteroposterior skeletal changes of the maxilla and mandible based on SNA, SNB and ANB were minimal. Linear measurement of lower anterior facial height (ANS-GN) and angular measurement (GO-GN) showed insignificant increase in vertical skeletal dimension. This result showed that by using proposed appliance, anterior facial height does not increase. It is very important in patients with normal vertical growth pattern and patients with mild tendency to vertical growth pattern that candidate for molar distalization. It can be concluded that the proposed banded intraoral appliance can correct class II molar relationship in non-cooperative patients as short time treatment method. Molars displaced distally by bodily movement and tipping. Skeletal change in anteroposterior dimension and vertical dimensions was minimal. Bulky form of appliance and heavy force of screw were limitations of our appliance. we will hope to introduce other appliances in future with better patient acceptance. Authors’ Contributions: Valiollah Arash: supervision of the thesis, case selection, and idea development. Sina Haghanifar: cephalomeric preparation before and after study. Iman Dabbaghian: did the study to fulfill his undergraduate thesis. Farhad Sobouti: cephalometric analysis and manuscript preparation. Ali Bijani and Reza Alizadeh-Navaei: statistical analysis. Funding/Support: We appreciate valuable financial aid and support of deputy of research and technology from Babol University of Medical Sciences.